This page will introduce a partition tool, with which you are able to resize system partition in Windows Server VMware. Download IM-Magic Partition Resizer Server to increase the size of system partition in VMware when it runs on low disk space. How does partition software work for system partition resizing in VMware? Usually, professional partition works as partition magic to help move free space from another partition to system partition. IM-Magic Partition Resizer Server is such a partition tool, which allows you to shrink any partition on the same hard disk to squeeze some unallocated space. Then, you can add the unallocated space to the system partition to get it expanded. This partition software can work in Windows Server Vmware and helps you resize hard disk without touching any data or having any influence on the operating system. You need to move the unallocated space close to system partition. Right click system partition and choose "Resize/Move" option. Move the arrows to add the unallocated space to system partition and click "Apply" button. "There are three partitions on my PC in VMware. The problem is that both C drive and D drive are running out of disk space, and only E drive still has some free space. Considering data stored on those partitions are not so important, so I decided to format the partitions to free up disk space. Firstly, I performed a quick format on D drive and everything is ok. However, when I formatted C drive, system says that C drive cannot be formatted. So I decided to delete files stored on the C drive. I deleted most of files successfully, but when I reboot my PC, some files still remain on the C drive and C drive still has low disk space. 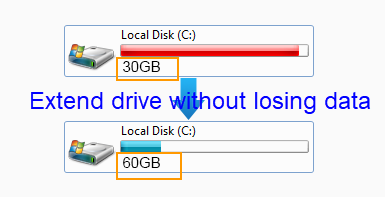 How can I free up disk space on C drive in VMware? My PC runs Window Server 2003 operating system in VMware." Probably, the reason why you cannot format C drive is that operating system is installed on this partition. In this situation, you can use the Server partition manager free to fix the problem. With the partition software, you can resize disk partition without formatting. Instead, you just need to perform a few mouse clicks to move the free space from another partition to system partition. What you should know is that you can only move free space on the same hard disk to system partition. You cannot squeeze free space from another hard disk. Why Select IM-Magic Partition Resizer Server? You can repartition hard disk to reallocate disk space to resolve the low disk space problem, but it requires you to reformat hard disk and reinstall system. In the partition repartitioning process, your important data might be lost due to many unexpected reasons. However, IM-Magic Partition Resizer Server provides a safe and reliable way to help reallocate disk space without touching any data on the disk. 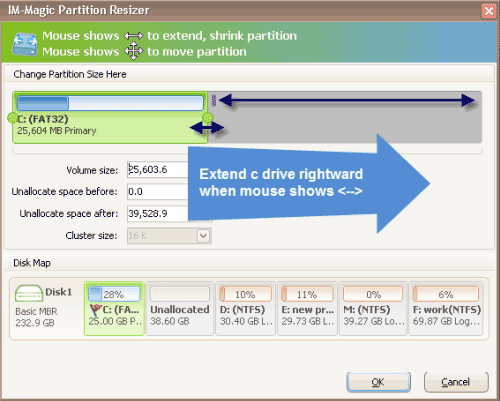 As professional partition software, IM-Magic Partition Resizer Server is quite easy to handle. It can not only work on basic hard disk, but also work on RAID 5 disk. You can easily extend system partition without operating system untouched.